So What Does The Overall Business Look Like? On an annualized basis, the company will do about $1B of revenue this year. The business has historically grown modestly at just 10-15% per annum, but it is quite profitable with 30-35% EBITDA margins (though a big drop to 24% this year). Rather than focus on top-line growth at all costs, IAC / Match have run the business shrewdly, acquiring accretive brands and focusing on cost savings and profitability. The end result is a meaty, diversified dating business with staying power. I'm sure we will see many more tuck-in acquisitions from Match going forward. So why did EBITDA drop to 24% this year? This is largely due to a business mix shift. Large user base apps like Tinder and OkCupid have higher hosting fees driven by high user growth and more product features, and they also utilize in-app purchases which is lower margin revenue since Apple takes a cut. 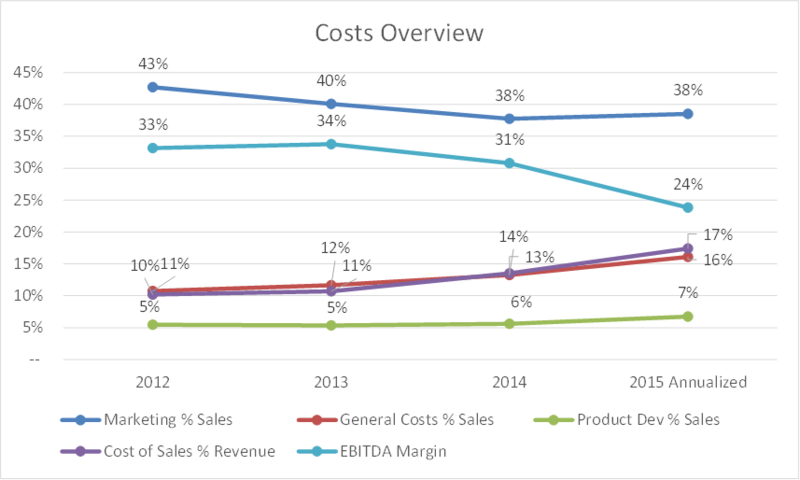 Other than that, key cost items such as sales and marketing and product development have been relatively stable as a percentage of revenue. Digging a little bit deeper, we can also see that North America makes up about 2/3 of all paying members while international users make up the remaining 1/3. Monetization, measured by average daily revenue per paying user (ARPPU), is around $0.55-$0.60. 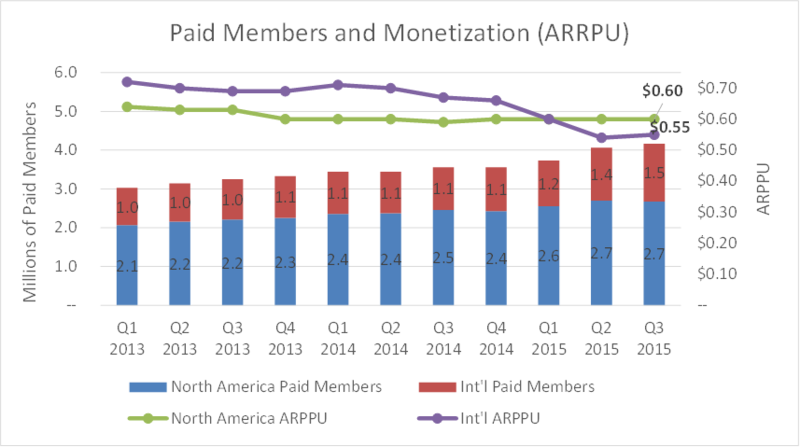 Again, the slight downward trend in monetization is likely due to more of their user base coming from lower ARPPU apps such as Tinder. Match Group announced their price range at $12-14 per share. At the midpoint, the business would have an equity value of $3.1B. In start-up land, we would derive a valuation multiple from that, in this case roughly 2.7x NTM revenue and 11.3x NTM EBITDA. However, the situation is trickier here since the business has considerable debt and so we would want to look at enterprise value. Part of the IPO proceeds are being used to pay off some debt and refinance some other debt and credit lines, so the calculations are more complex and out of the scope of this blog post. The key takeaway for me in the online dating space is that no single product has been able to effectively serve the dating category as a whole. Match and eHarmony helped create the category many years ago, but many other niche sites such as Christian Mingle and JDate also gained steam. Following that, we saw the proliferation of mobile dating apps such as Tinder, OkCupid, HowAboutWe and Hinge, many of which were geared towards a younger demo or some other niche. The list goes on on. Match is very fortunate to own high growth brands such as Tinder, a business my gut tells me would be hyped up to unicorn status in the private markets. Yet, even with Tinder which makes up almost none of Match's revenue, the aggregate business is worth just $3.1B. Regardless of sum-of-the-parts valuation questions between Tinder and Match, it does seem like the company has the right approach in aggregating as many online dating brands as possible under their umbrella. This seems to yield a stable, predictable business that public investors can understand and get excited about.